Most guitar teachers want to have more students and earn more money. But many hit a glass ceiling when they attempt to grow their business. …using the same mindset, strategies and business model that got you stuck in the first place. There are many ways to grow your income from $0 to $40,000 per year teaching guitar. Only some of these ways let you keep growing to 60, 80 or $100,000 per year without getting stuck. Even fewer allow you to go beyond $100,000 and reach the $150,000 – $250,000 level. The traditional guitar lessons business model (of teaching 1-1 lessons) is not scalable. The number of hours you are available to teach (we all have just 24 hours per day). The amount of money you charge per hour (your income is limited, no matter how much you charge). Yes. Teach your guitar students in groups. This removes the glass ceiling over your head and allows you to grow your business faster. Constantly replacing guitar students who quit. Your guitar students don't get (big) results in their playing because they quit lessons sooner than they should. You struggle to earn the money you can and should be earning as a guitar teacher. 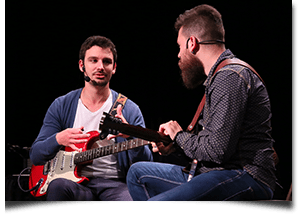 If your average student stays with you for less than 2 years, you have a big opportunity to improve your guitar teaching business very quickly. Good news is: this problem is simple to fix when you sit down and think about it. Grab a piece of paper and a pen right now. Now, make a list of 30 ways you can motivate your students to stay with you longer. Then begin to implement the things on your list to improve your student retention. Not sure what to do to get your guitar students to stay longer? Download this free guitar teaching eGuide to learn how to keep your guitar students studying with you for years. You know what all successful businesses have in common? They rely on systems to get things done. A system is a repeatable process designed to produce a specific result in your business. Attracting prospective students to contact you about guitar lessons. Converting prospective students to become your actual guitar students. Teaching your students to become good guitar players. Motivating your guitar students to continue taking lessons with you for years. Encouraging your students to refer their friends to you. Reaching out to guitar students who quit lessons with you to inspire them to come back to lessons. Unfortunately, many guitar teachers have zero systems in their business. Nothing is organized into a process and nothing is tracked. Make a list of all the actions you take to grow the most important areas of your guitar teaching business. Track your results and refine your systems over time. Their own potential to become very successful. … they get in their own way and hold themselves back from achieving the things they say they want. Most people think that money is the “root of all evil” and that wealthy people are bad, greedy and take advantage of others to earn their money. Do you think a person with this mindset is likely to build a 6-figure guitar teaching business? Examine your beliefs carefully. Eliminate the ones that don't serve you and replace them with the ones that do. Most guitar teachers never fully commit to building a successful teaching business. Many teach only to “pay the bills” or to avoid working a non-music related job. Their teaching business becomes their day job that keeps them trapped, earning little money and not having a life they would really enjoy. Commit to building your teaching business to a level you truly want. Invest the time upfront, so you can have the life, freedom and fulfillment other guitar teachers only dream about. 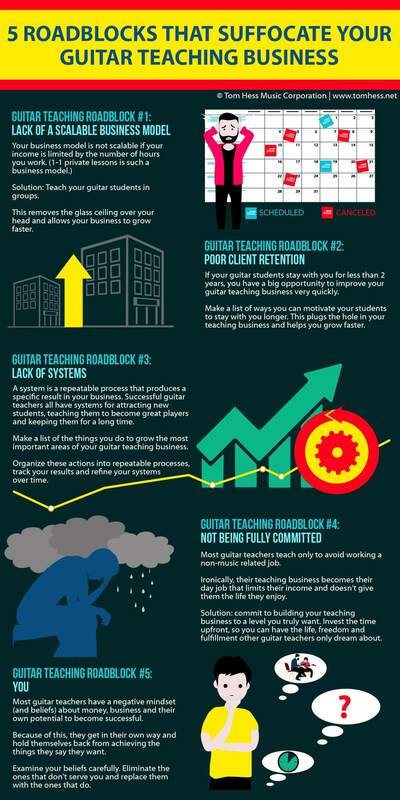 You now know the biggest obstacles to growing your guitar teaching business. The next step is to improve the one area of your business that helps you grow most quickly. Download this free guitar teaching eGuide & learn how to keep your guitar students happily studying with you for years. Is it really possible to earn 6-figures per year teaching guitar less than 40 hours per week? Learn the truth about making money teaching guitar.